Ashlee & Brad came down for the Outback Bowl. We picked them up and went to Ybor City for lunch. Ybor City is an urban renewal project. It was originally a Cuban neighborhood and there were many cigar factories. Now Ybor City is a tourist hot spot and the place to take off your top during Gasparilla. Most of the wild behavior takes place after dark so we felt pretty safe during the day. One problem is parking. Urban spaces just don't lend themselves to parking and most of the street parking was blocked off because of the parade that was to take place later that day. The few lots we found were owned by the community college and closed to us. We ended up in the parking garage blocks away but the day was beautiful and the walk was fine, and downhill. 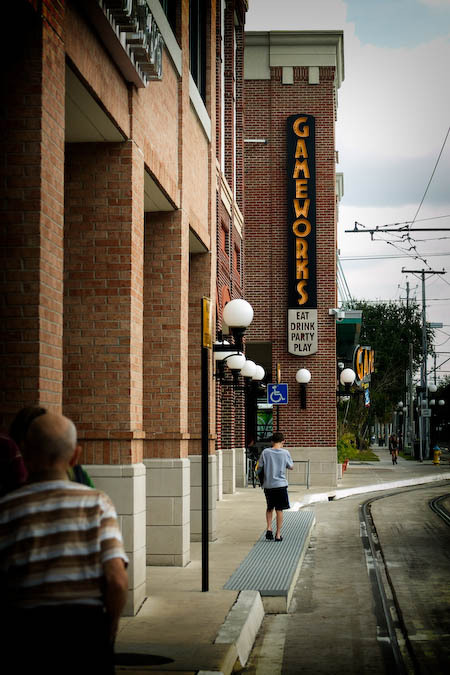 Gameworks is owned by Sega and is filled with Sega video games to play. We got each boy a $10 card but they didn't seem to want to play. Andy was interested in what was upstairs and taking video of the elevator. Brad went with Ryan to play some games but Ryan couldn't settle on anything. At one point, Ryan did want to play the car simulator game but the card reader was touchy and it wouldn't take. We thought he was out of points and I went to get more, but he wanted nothing to do with the games or card after that. He continued to walk around and look on as others played the air hockey. Ashlee and Brad tried playing a game hoping to entice Ryan but he wouldn't play. He wouldn't even watch them. Andy wandered about and played a few games. He liked the games where the seat would move around. And he took plenty of shaky, short and dark videos. He needs plenty of more practice before we can upload any to YouTube. Dad, Ashlee, Brad and I got a chance to talk. I really hadn't talked to Brad as I usually saw him with a crowd, ie my family, and he seemed more subdued. Dad got a chance to talk to Brad about the FairTax Book. This book has really got him riled up and I am not one to talk politics and/or finances. I realized that I didn't even know where Ashlee was working. I know I don't keep up with family. I never think to ask questions. We left about 2:00 pm and walked back to the car. The walk was all uphill and if you have been to Florida you would know that that means nothing. Florida is mostly flat and you would need a transit to see a grade change. But after eating a large-ish lunch and few beers (not me, I was driving), Dad was ready to rest at the half-way point. But he wouldn't stop. It might have been fun to take the street car but it wasn't cheap, something like $2.50 per person, one way! Brad wanted a chocolate shake from Chick Fil A and Ryan wanted some chocolate milk. We had the GPS find the closest one (which wasn't really close) but was sort of one the way back to Brad's and Ashlee's hotel) but it kept wanting to take us on the interstate. So I named it Lois since she was always driving the freeways in Toledo. BTW, I had a Peppermint Chocolate Chip Shake and it was tasty. I was surprised that Ryan drank the milk!! The boys must have done more walking that playing as Ryan was asleep before 8:00 pm and Andy was in bed and quiet before 8:30 pm. Which leaves me up typing this past 10 pm.